A desperate Woman… Sherlock Holmes !! “Excellent! I cried. “Elementary.” Said He. 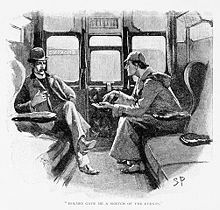 In an English course as an elective by mistake Teacher had us read Sir Arthur Conan Doyle. I experienced feelings more powerful than crushes on boys and the hate of peer pressure. It all fell by the side. The wit and intelligence of a detective moved me. My only regret is not taking it on as a profession myself. Also never thanking her, the teacher that turned on the light; if only for a few months. Thank you my dear lady !! This entry was posted in "In the beginning there was a void except for the written word." The Avengers (Band) and tagged Alternative music, Daily Prompt, Depth Psychology, Hudley Flipside, Jr. High School, Middle School, Oral Tradition, Peer pressure, postaday, Sherlock Holmes, Sir Arthur Conan Doyle, Subculture, Underground, Women. Bookmark the permalink.